Venue: Municipality (near the traffic lights). The first indoor flea market in Lefkosia where one can find new and used books, toys, art crafts, furniture, household items, electronics, appliances, clothes, collectibles and antiques, as wellas a coffee shop. The Lefkosia Municipality established a series of thematic walking tours to present various aspects of the old city as well as the city outside the walls. Lefkosia, a city with 5,000 yearlong history, has much to offer. By walking, one gets a better feel for a place and its yearlong atmosphere, past and present, and a better understanding of its continual cultural development. Guided walking & bus tour. The Walking Tour leads you to the most noteworthy sights in ‘Pallouriotisa’ and ‘Kaimakli’, two old villages at the outskirts of the Venetian Walls. As Lefkosia grew and expanded these villages gradually became historic districts of the city. Guided walking tour. Lefkosia, the only divided capital in the world, dates back to the Bronze Age. In antiquity and in early Christian times it was known as Ledra. 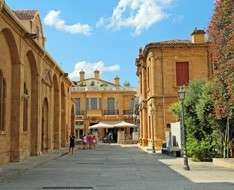 It has been the capital of Cyprus since the Late Byzantine period (11th century). The Lusignans transformed it into a splendid city, with royal palaces and churches. The city centre, the old “Chora”, surrounded by 16th century Venetian Walls, with museums, old churches and medieval buildings, maintains the leisurely atmosphere of yesteryear. Cost: Gratis! Offered by the Lefkosia (Nicosia) Municipality and organised in collaboration with the Deputy Ministry of Tourism and the Cyprus Tourist Guides Association. For further information and bookings please contact T. +357 22 674 264.